Approaching the restaurant there are curb cuts to all of the intersections and crossings. The sidewalks are very wide with no obstructions. I would say that if you needed to park a scooter outside, there is room near their patio. The small patio at sidewalk level did not have furniture out when I visited due to the cold weather. When the weather is more forgiving the patio is used- though it may be a little tight to move around if you have a mobility device. The front door does not have an automatic door opener. This door is 33” wide with a 0.5” metal threshold plate. There is another door inside that is 35” wide to access the restaurant. In the space in between the two doors there is a coat rack to hang coats, umbrellas or canes! How nice! Inside the restaurant there is a cool, casual vibe and a fair amount of seating. There is only one level and no steps or stairs anywhere in the establishment. The tables are 31” high with 28.5” of clearance; although some sets are a little lower with 27” of clearance. The flooring is smooth, untextured concrete. Turning space is OK, but one may need to move a chair or two if you have a large stroller/mobility device. The menu has fair contrast and is quite readable, but they have a different, smaller text menu for lunch that may be hard to see for some people. They do have a menu online that you could pull up. They do not have a braille menu. The lighting and temperature are good and service animals are welcome. As an added bonus, the manager let me know they have an air filter system that cleans the air to a high standard for people with asthma/respiratory problems triggered by allergens. The hall towards the washroom is about 43” wide. The accessible washroom is at the very end of the hall on the left. The washroom is a private room with ample space and a door width of 33”. There is no automatic door opener, but there is a lever handle and the door moves easily. The sink is 33” high, with a manual soap and automatic hand dryer nearby. There are two grab bars surrounding the toilet: the one behind the toilet is 36” high and the one on the wall to the right is 28.5” high. The toilet has a manual flush lever that may be difficult to access as it is on the side against the wall. There is a working emergency button on the wall beside the toilet. 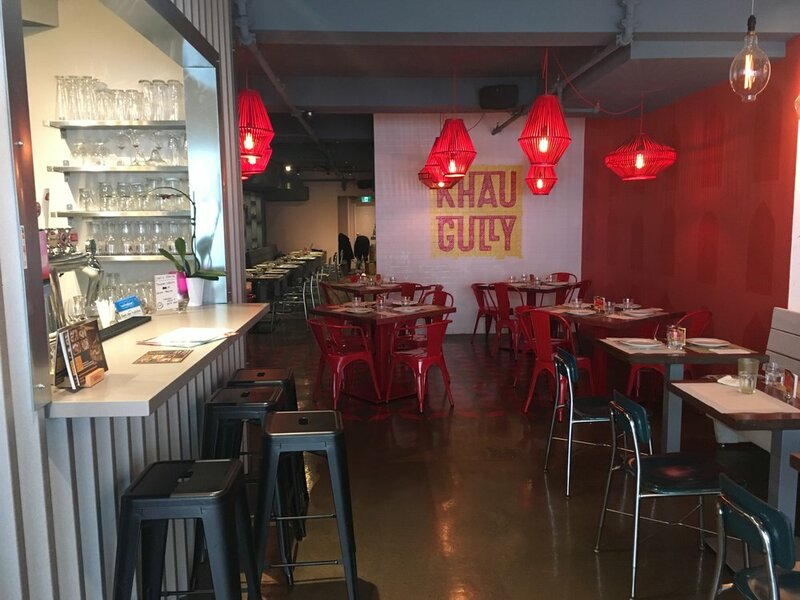 The best way to get to Khau Gully would be the accessible Davisville or Eglinton subway stations on the Yonge Line. From Davisville you would head north on Yonge St. on the east side, from Eglinton you would head south on the east side. If you are coming from the north you could also take bus 97 that runs south on Yonge. The restaurant does not have designated parking, but it is far enough from the core that there are side streets around for you to nab a spot. The front signage of Khau Gully is large and easy to spot. I sat at the small bar and happily enjoyed a hot masala chai drink while browsing their website. I noticed something on there about an upcoming secret menu. Intriguing! Overall, it looks like a decently accessible restaurant and a great place for some classy vegetarian (or meaty) Indian food.